Soft, chewy chow fun noodles are one of my favorites. If you can find them fresh at your local Asian grocer even better, but boiling up some dried noodles can do the trick. 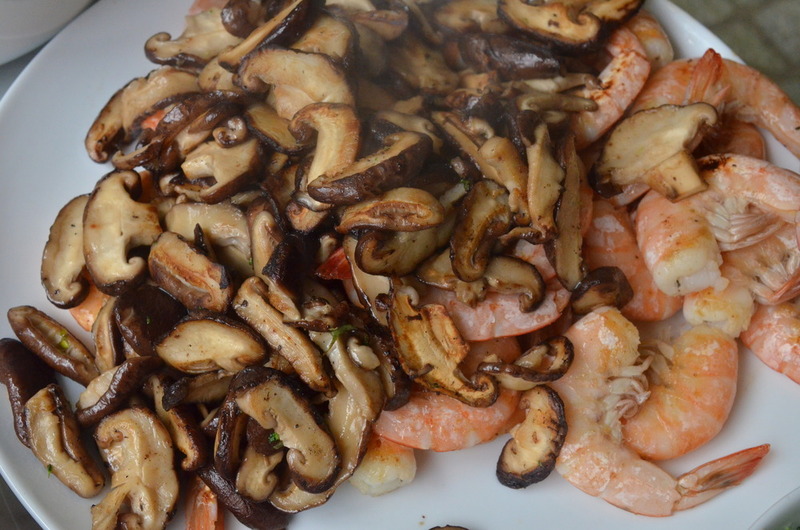 Cooking the shrimp and vegetables separately in shallot oil beforehand is the real secret to the dish, allowing you to avoid "crowding the pan" and sear in the maximum amount of flavor, leaving you with an impressive professional meal. Heat 1-2 tablespoons of shallot oil in a large wok, cast-iron, or non-stick skillet that can withstand high heat. Turn up to high heat. When pan is completely heated, add your shitake mushrooms. Toss until browned, then remove from pan. Heat 1-2 tablespoons of shallot oil to the pan again and add snow peas. Toss until browned, then remove from pan. Heat 1-2 tablespoons of shallot oil to the pan again and add broccoli and 1/4 cup of water (or more if the broccoli begins to burn before completely cooked). Toss until browned, then remove from pan. Heat 1-2 tablespoons of shallot oil to the pan again and add shrimp. Toss until browned, then remove from pan. Heat 1-2 tablespoons of shallot oil to the pan again and add beaten eggs and scramble. Add in your noodles and the rest of your oil (continue to add shallot or other high-heat cooking oil if noodles begin to stick) until warmed through. Add in the rest of your cooked ingredients, basil, fish sauce, chili pepper, salt and pepper and toss. Serve immediately.